Game 3 of the Western Conference Finals will not want to be discussed by either the Rockets or their fans. Stephen Curry finally had a resurgence and scored 26 of his 35 points in the second half, leading the Warriors to a 41-point blowout. 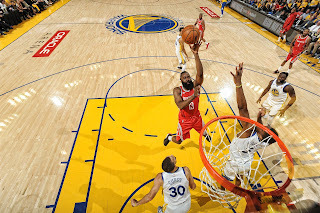 The Rockets were unable to withstand the big third quarter from Curry and just seemed to be a step behind on both ends. The Warriors are already difficult to beat as it is, but it's near impossible when they're on their home floor and Curry explodes like he did. If there is one area the Rockets can look at improving the most, it is the easy looks that were not converted. It may not have made much of a difference considering the team lost by 41, but easy looks against a great defensive team like the Warriors are hard to come by and you have to make them when you get them. Paul does a good job of creating space against Looney with the crossover. However, even after creating the separation Paul is unable to convert on the midrange jumper, which is his bread and butter. Looney is somewhat able to recover and half-close out, but Paul mostly had an open look. Paul finds Clint Capela on the penetration and Capela quickly passes the ball back as Curry comes over to help, leaving Paul open under the basket. Paul goes for the layup and is unable to convert again. Even with the minimal contact from the larger Draymond Green, this should have been an easy two points for the Rockets. Notice how Capela also fails to capitalize on the easy tip-in opportunity. It is evident the Rockets love attacking whatever big the Warriors have on the floor. Steve Kerr elected to insert rookie Jordan Bell after Looney got into foul trouble. Harden is able to blow by Bell with ease and fails to convert the wide-open layup. This should have been the easiest two points of the night for Harden, even with his off hand. The Warriors were able to run out after the rebound and finish with a mid-range jumper from Klay Thompson. Those little point swings really hurt, especially on the road. Gordon is able to get in front of Looney for what seems to be an easy layup. Green shows but does not fully commit to the help. That should have resulted in an easy two points for Gordon and the Rockets. You can see Gordon complaining and looking for a whistle, but the layup should have been converted regardless. Look, these little clips would not have made a difference in the outcome of the game. A 41 point loss is a 41 point loss. It was going to be an impossible feat to pull off the comeback once Curry got in a rhythm in the 3rd. The Rockets shot 11-25 in the paint in the first half. That creates opportunities for the Warriors to get out in transition, where they look to annihilate opponents. The effort will simply need to be higher in Game 4 if the Rockets want this to become a best-of-3 series with two of those games in Houston. Harden and Paul cannot be as lackadaisical with the ball. Easy buckets need to be converted. This team knows going down 3-1 will likely result in their season ending without an NBA Finals appearance. It should also be noted that no one truly knows the severity of Paul's Achilles injury. Paul and Houston's training staff said he is fine, but no one knows for certain. This might just be an injury he has to withstand for the duration of the playoffs. It was one game. The Rockets can forget this night ever happened and move on to Game 4. Focus on the task at hand, which is splitting the games in Oracle. All of that is still possible, even with the 41-point beatdown.